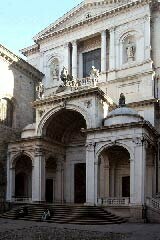 Off the tourist radar, Bergamo is often bypassed by Americans; Europeans, however, find it easily accessible and flock to it for its myriad pleasures, which have somehow been maintained despite a millennium of various domineering rulers and nations that took their toll on the city, until Garibaldi liberated Bergamo from the Austrians in 1859. 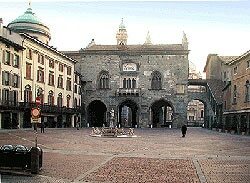 Bergamo, a walled city in Italy’s Lombardy region, lies along the route for those visiting Italy’s northern lake country, just off the A4 between Milan and Verona. The outskirts of the city offer little to draw the eye; the lower, newer part of Bergamo is fairly nondescript except for the Carrara Academy, whose collection includes an array of Renaissance masters like Tintoretto, Bellini, Lotto and Titian. The broad Piazza Matteotti leads to the upper part of the city, which you enter through 16th-century Venetian portals. Ditch your rental and take the funicolare—a cable car pulled up the hill—up to the old part of town, then walk straight into the heart of Bergamo. Steep, shiny cobblestone streets lead to the Piazza del Duomo, which is as splendidly sized as any in northern Italy, not grandiose but human in scale. Equally beautiful is the Piazza Vecchia, with its 12th-century bell tower and graceful fountain. Beyond these there are winding narrow pathways teeming with locals. The farther you get from the center, the quieter the city becomes behind its ancient walls. Bergamo is the birthplace of the Commedia dell'Arte, so the shops have a good selection of masks. But this is not a highly dramatic city; instead, it has dearness in its close quarters and streets, which are all scrubbed clean; the many shops, pasticcerias (pastry shops), and food stores burst with color. With so many cultural influences determining the city’s fate over the centuries, the Bergamasks are sophisticated but not overly effusive and strike a distinct northern reserve. But teenagers, like their contemporaries everywhere, bound from one side of the street to the other, singing pop songs, finding their friends, and skidding past their elders, who walk with a gait that is not frail but deliberate and slow, so as to take in a good day’s sunshine, the purple twilight of an evening, the starry skies at night. Around the Piazza Vecchia everyone flocks to the fountain, and visitors stroll to the Basilica of Santa Maria Maggiore. This is the center of Bergamask life, never frantic, ever sweet. Two restaurants caught our attention, Taverna Colleoni dell’Angelo and Vineria Cozzi. Set just to the side of the Piazza Vecchio, the large Taverna Colleoni dell’Angelo sports a comfortable formality inside with tuxedo-clad waiters, and an unpretentious gentility that makes lingering here a great luxury. There are many outdoor tables where you may watch life in the Piazza. Taverna Colleoni respects Lombardian culinary traditions while bringing them to a level of refinement, evoking wonderment about how the Italians do it with what seems like so little effort. The wine list is exceptionally good, worldwide in its scope, including American labels like Atlas Peak, Opus One and Rubicon; the tablecloths are heavy azure damask, set with lace doilies and fresh flowers. A meal might begin with an amuse of marinated salmon on greens and radicchio accompanied by sips of sparkling prosecco. For antipasti, dive into a plate of large shrimp, calamari and lentils scented with rosemary. Lovely pastas include trofie (tiny squiggly dumplings) with stewed tomatoes and taleggio cheese; and tagliatelle with porcini mushrooms, cream and an unexpected spoonful or two of blueberries. A perfectly cooked monkfish has the curious addition of a lemon grass stalk that gives piquancy to a dressing of tomato and zucchini. A flavorful, tender veal medallion is dressed in a mushroom sauce and creamy yellow polenta. Treat yourself to a slice of rich savarin cake capped with spun sugar, complimented by a perfect espresso. When the Duomo bell chimes one hundred times at 10 p.m., it’s time to go home. For all the above, the bill comes to a little over $200. Taverna Colleoni dell’Angelo accepts all credit cards and is closed on Mondays. The sweet façade of Vineria Cozzi will immediately win your heart. Venture to the rear to find two small dining rooms with red-and-white diamond-patterned floor tiles, bent metal chairs and walls of yellow-ochre banded with green wainscoting, one hung with an enchanting cherub who watches over you while you dine. Inside is also a bustling wine bar. Consider the cansonsei pasta, which translates to "little britches," twisted like candy wrappers containing cheese, sausage bits and sage, in a rich sauce of butter and Parmigiano. Plump ravioli with smoked cheese rests on a bed of spinach, braised fennel, pignoli and sweet raisins. A good choice is confit of duck with roast potatoes, grapes and prunes; skip the roast rabbit and polenta. With a bottle of sturdy Valtellina wine, the bill comes to about $95, including tax and service. Or opt to eat at the wine bar up front, where you may sample and sip and pay very little for a fine casual lunch. Click here to see more restaurants in Italy. Going to Italy? Check our guide. 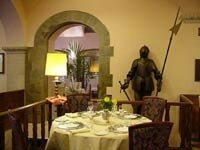 * Restaurant images courtesy of Taverna Colleoni dell’Angelo and Vineria Cozzi. Bergamo images courtesy of Comune di Bergamo, www.comune.bergamo.it.